Our team is thrilled to announce that a book about the UIF program has been published! The book, Designing for Change: Using social learning to understand organizational transformation, was written by renowned social scientists Beverly and Etienne Wenger-Trayner. The book is a case study of the UIF program and brings to life decades of the authors’ research in social learning theory. As we learned, books take a long time from inspiration to publication. We began this project in 2015, while we were still operating under the NSF-funded National Center for Engineering Pathways to Innovation (Epicenter). We engaged Beverly and Etienne to write a white paper that would apply their social learning theories to our program in order for us to better understand its impact on the individuals in our community as well as their schools and organizations. Today, this book is a rich portrayal of our program — with its strengths as well as areas for improvement — seen through the lens of the authors’ social learning framework of value creation. Their rigorous analysis weaves in quantitative data obtained by our NSF-mandated external evaluator, and is augmented with stories from Fellows, and photos of all the remarkable people that make up the UIF family. We are excited to see these insights shared in such a compelling way, and we hope they will inspire other programs to incorporate social learning strategies in their change work. The book is available on Amazon: http://bit.ly/uif-book. When Alexandra Seda, a University Innovation Fellow at Ohio Northern University, co-facilitated a workshop during Stanford University’s Global Entrepreneurship Summit, she met passionate changemakers from around the world. Here, she shares stories of five female entrepreneurs as well as her own journey of transformation. Applications for the University Innovation Fellows program are due October 31, 2016. A globe, a mountain, and creative people. What do they have in common? They’re what came to mind when I first heard about the Global Entrepreneurship Summit (GES). In June, I traversed to the West Coast to be one of nine University Innovation Fellows to co-facilitate the “Hack Your Creative Culture with Stanford d.school and Google” workshop, which was a partner event of GES. There, as students, we had the opportunity to share the steps we took to ignite change on our university campuses. The workshop was important because the process that my peers and I practiced to activate change on campus would be shared with entrepreneurs from all over the world. Having the opportunity to possibly help a million people by teaching one person was a rewarding experience. Our willing participants were entrepreneurs who were hand selected to attend the 7th Annual Global Entrepreneurship Summit in Silicon Valley. We shared with them our methods to ignite change via the avenues of person, place, process, and passion. In return, they enriched us with their perspective. “How do we enact change?” was a question my student peers and I sought to answer in helping to create an ecosystem of innovative and entrepreneurial opportunities for fellow students on our campus. A key to our success in engaging students at Ohio Northern University was recognizing the importance of environment. It is the foundational piece in adopting a culture where students can be creative inside and outside the classroom, which results in incredibly empowering outcomes. We recognized that our environment was not inspiring our students to think outside of the box or ask probing questions. The GES participants chosen were selected from more than 5,000 entrepreneurs from across the world who submitted applications. The selected participants represented 170 countries and territories. They came from various parts of the globe, from Madagascar to Slovakia, to do one thing: connect. The power of connecting with different people is receiving the benefit of different perspectives, networks and insights. The GES event matters because when entrepreneurs from various parts of the world connect with one another, they will become better at solving problems and generating solutions to help larger groups of people at a larger scale and faster pace. During the “Hack Your Creative Culture” workshop, Fellows shared ways in which they have helped shape or influence the education of their campuses by connecting with people, transforming places, enacting processes, and discovering passions/purposes. There is no one way to enact change; individuals must pave their own paths according to the needs of their respective communities. That day, the University Innovation Fellows created their own portals to travel through in order to understand the perspectives of the people around them, define the needs, brainstorm ideas, test and enact solutions. The definition of “portal” is a doorway or gateway. In the same way as Fellows, the entrepreneurs at the GES event formed their own individual portals in their communities to tackle problems, form solutions, and scale the solution to the size of need. While the “whys” of their stories are all different for all entrepreneurs, their stories share the power of connecting with others through portals. Portals are exciting. Often these gateways to “wow” solutions that seem to do the impossible can feel out of reach for us, but when we hear the story of the person behind the portal, suddenly the experiences that lie ahead of the portal seem possible for all. During my high school years, I seriously wondered if I would ever have the opportunity to serve others in a large way. That wonder turned into a belief in my heart that I had something to give to the people around me. I had an understanding of my responsibility to help others. I knew that my creativity was a skill worth developing further in order to do the most that I possibly could for others with the life that I was given. This belief is what spurred me to take a portal from Alabama to Ohio Northern University (ONU) to pursue engineering. And it was at ONU where I connected with incredible professors who pushed me to challenge myself in achieving more than I ever thought I would have by entering the UIF program. My life was forever changed once again, and through UIF, I was pushed to portal again to the Global Entrepreneurship Summit to share my insights of enacting process for change with entrepreneurs from all over the world. We’re going to step through a few example portals from different participants to learn their perspectives, light bulb moments and advice for college students. And now we travel to portal number one. Michelle Moghtader, a former journalist based in the Middle East, discovered a gap between countries. She noticed that each time she traveled to the two portals, Iran and the U.S., people would always ask questions about what the other portal was like. Michelle, passionate about storytelling, was impassioned to fill in the gaps that the news would often leave out about what life was like in different parts of the world. She co-founded Shared Studios, a multi-disciplinary arts, design, and technology collective. Through Shared Studios, literal portals were created: a global network of interconnected golden shipping containers. The golden shipping containers are equipped with audio and video technology so that when individuals enter one, they are face-to-face and have the ability to communicate with someone else in a portal from another part of the world. The experiences that people in these portals have are unforgettable and eye opening, because individuals are physically going out of their way to connect with someone worlds away. Light Bulb Moment: Entrepreneurs are intentional about connecting with people who are different from them or that know something they do not know. Portal number two brings us to Swaziland, Africa, to meet Sindi Ntombini, who understood and experienced the need of the people of her homeland. Sindi recognized that many of the books provided through the African school systems were largely written about life in every part of the world but Africa. She recognized the impact that not having Afrocentric children’s reading and learning materials could have on her daughter’s identity and self-esteem, as well as imagined a whole continent of children possibly being negatively impacted the same way. Light Bulb Moment: Entrepreneurs are driven to make available the solutions they create with communities big and small. When entrepreneurs tackle problems, they have the ability to see the “one,” while at the same time being able to see the “many” in need, and gleaning any necessary insight essential to making things happen. Away we go to portal number three, which brings us to Pakistan! Here we meet Kalsoom Lakhhani. She worked in philanthropy and was a former news blogger. She realized that Pakistan had a negative perception in the news. She would blog about the untold stories left out by the news from interviews she had with filmmakers, artists, and changemakers, essentially people on the ground doing really cool things. When she would encounter the same people she had interviewed with those great ideas again a few months later, she discovered that many of those ideas hadn’t taken off because there were no mentors, no investors, and siloed environments. She realized that internationally, when people would look to invest, they would overlook the hard environments, where the potential was still really high. She wanted to create and provide a solution in places where there was not one. She decided to pave a new path, and so she founded Invest2Innovate. Based out of Pakistan, Invest2Innovate identifies early stage entrepreneurs, provides business support through their accelerator program, and maintains an Angel network that matches entrepreneurs with seed funding. They support startup communities in growth markets. The mission of Invest2Innovate is to create and help startup communities flourish in places where people would least expect, the high potential areas with a lot of growth yet to go. And while they support the startup communities, they also seek ways to support the environments that surround the startup communities. Light Bulb Moment: Entrepreneurs have the ability to see potential in people, places, products, and things before others do. The factors that predicate whether an entrepreneur sees a venture worth pursuing are factors that are measured by an unrecognized/unspoken need, experiential knowledge, and a willingness to experiment with no guarantee of reward. Portal number four takes us to Sandton, Africa, where we meet Nokwanda Thulile Mathenjwa. Nokwanda noticed that she had many clothes, purses, and other accessories in her closet that were collecting dust or space because she had either worn/used the items once, twice, or never. She realized that though these items no longer matched her current style tastes, the items might still be relevant for someone else’s fashion tastes. Nokwanda solved her own personal need and believed that the solution could scale to the market, and so she created Yamilet SA. Yamilet SA is a retailer that buys and sells pre-loved clothing and accessories. Yamilet SA’s website states that they are the “retail unicorn that allows customers to find a treasure, protect the environment, and save money.” Nokwanda’s focus is to provide a refreshing shopping experience where buyers and sellers alike can benefit economically while also helping to save the environment from manufacturing wastes that would have occurred had new clothing and accessory items been produced. Light bulb Moment: Entrepreneurs can solve their own personal needs and scale the solutions to the market if they know that the solution is entering an unsaturated market. This can lead to disruptive innovation by creating an offering that was not previously thought of or made available. We have now arrived to portal number five in Nigeria to meet Desayo Ajisegiri. In 2007, Desayo contracted malaria, which nearly took her life. When Desayo had the opportunity to study in the U.S., she decided to study medicine where she later uncovered her interest in innovation and in creating solutions that would help combat the serious issue of Malaria. Desayo switched her major to chemical engineering and began researching methods of repelling mosquitoes. She learned about an effective ingredient that repelled mosquitoes, but realized that the ingredient was inaccessible to the people who needed it most. Desayo formulated a solution that could be incorporated into something the people of Nigeria already used: laundry detergent. Desayo was successfully able to create a detergent that had a mosquito repellent solution included. The detergent provides clothes with the ability to repel mosquitoes for 14 to 27 days. Her solution was innovative in that it was able to take something that was largely inaccessible and provide a way for the ingredient to be accessible and convenient for the people that would use it daily through the washing of their clothes. Light Bulb Moment: Entrepreneurs create solutions that are innovative. By innovative, I mean accessible and useful to the people who will benefit from the product. The ability to create, design, and invest in solutions that don’t change human behavior and seamlessly fit into daily routines is revolutionary. The five portals above show how the Global Entrepreneurship Summit is truly important because we are part of a much larger community: planet earth. The more we connect as a group of problem-solvers and changemakers, the better we become at discovering, designing, and testing solutions to scale to the needs of the people around us. We become smarter when we are more informed about perspectives that are not our own. Being on the summit of a mountain is helpful because we have a better vantage point of where we have previously been. The more we learn about others and what’s currently being done, the better we become at creating innovative, life-changing things that people need to go about their daily lives. After GES, I felt re-energized and encouraged after interacting with all the entrepreneurs I encountered. Each entrepreneur I spoke to was optimistic about the future, and many of them were thinking about ways in which they could play a more active role in improving their communities. Before I truly understood what entrepreneurship was and the people who chose this way of life, I used to go along with the uninformed opinion of the people around me — that entrepreneurs only do what they do for the money. After the interactions I had with the entrepreneurs at GES, I was able to confidently say that what others said about entrepreneurs is simply not true. Entrepreneurs would not be entrepreneurs if they didn’t care about people, because people are the number one reason why they have the opportunity to make, fail, then make again. Seda (right) with Gabriel Conners, a University Innovation Fellow and co-facilitator at the GES workshop. As entrepreneurially minded people active within our communities, we must be vigilant and observe to everything around us. We must be comfortable being in positions that make us experience the need we are trying to fill in order to understand the issues at hand. Otherwise, we only become proficient at forming solutions based on what we think we know. Additionally, the call to pave a new path will always be for individuals who are observant and ready to answer the need before them. We must never forget to consider our own problems, because our problems might be experienced by others, and they could be waiting for us to scale our personal solutions to the market. Great entrepreneurs are special because they will spend however much time is necessary in order to research what’s available, learn about current solutions, and decide whether a better solution can be formed in order to ensure accessibility for the customers in mind. How will you portal and positively impact someone’s life today? At the William Jewell College Regional Meetup, University Innovation Fellows took part in a city-wide event to help Kansas City become a smart and sustainable city. When six student teams pitched their business ideas on a Friday evening in early April, it was hard to believe that they’d met only 12 hours earlier. This process of forming teams around ideas and pitching products in such a short time period is the purpose behind #OneDayKC, a student-run event hosted by higher education institutions in Kansas City, MO. This year, the event was combined with a University Innovation Fellows regional meetup hosted by William Jewell College. Fellows traveled from seven states to join Kansas City students and community members for #OneDayKC. They spent the second day visiting Kansas City coworking and accelerator spaces, connecting with higher education and business leaders, and engaging with prospective first-year students at William Jewell. On Friday, April 1, 60 total participants including Fellows and students from 18 different high schools, colleges and universities arrived at the Kauffman Foundation for #OneDayKC. The event was run by students from three schools: William Jewell Fellows Bradley Dice, Trevor Nicks, Macy Tush, Alex Holden and Ben Shinogle; Rockhurst Fellows Michael Brummett and Mike Frazzetta; and University of Missouri – Kansas City (UMKC) student Tin Ho. Trevor Nicks of William Jewell College kicks off #OneDayKC. Photo by Laurie Moore. #OneDayKC provided an opportunity for participants to connect with leaders and peers in the community to work on projects to help Kansas City become a smart and sustainable city. Participants were challenged to spend twelve hours forming a team, developing a product or service needed in the Kansas City area, and pitching that product or service to the whole group and a panel of judges at the end of the day. The day kicked off with inspirational talks from thought leaders who are working toward recreating Kansas City into a “smart” and more sustainable place. Bob Bennett, the Chief Innovation Officer of Kansas City, spoke about his role in finding new ways to solve complex city problems, and Butch Rigby, owner of Screenland Theaters, discussed sustainable urban development. Leticia Britos Cavagnaro, the co-leader of the University Innovation Fellows program, led participants through a design thinking exercise, and Landon Young, Director of Creativity and Innovation at William Jewell College and co-founder of donateequity.com, shared details on the Lean Startup methodology. Attendees also heard personal stories of change in higher education from Humera Fasihuddin, co-leader of the University Innovation Fellows program, as well as several Fellows and student hosts of the event. Fellows and Kansas City students work in teams during #OneDayKC. Photo by Laurie Moore. The participants then formed teams around topics including energy and sustainability, transit and traffic, municipal services, health and well-being, education and workforce development, and culture and recreation. They spent the rest of the morning and early afternoon brainstorming on pain points that they could address and on experiments that would test their hypotheses. In the afternoon, teams visited the Country Club Plaza shopping district of Kansas City, where they conducted interviews with shoppers and pedestrians to gather feedback about their ideas. #OneDayKC participants speak with members of the public to gather feedback on their ideas. Photo by Chandler Eaton. Armed with the user insights, the participants worked to refine their ideas and pitches. That evening, the teams pitched their ideas at Rockhurst University to participants, invited guests and judges Frank Jurden of VML and TEDxKC, Tom Gerend of KC Streetcar, Humera Fasihuddin, and Dr. David Sallee, president of William Jewell College. There was a tie for first place: winners were Empower U and Village Education, two projects that focused, respectively, on community education and matching students with mentors. The #OneDayKC participants celebrate before their presentations. Photo by Chandler Eaton. On Saturday, the University Innovation Fellows who attended #OneDayKC met for their own day of activities. In the morning, Fellows visited the ThinkBig coworking space to hear from a panel of local entrepreneurs and educators. Panelists were Risa Stein, professor of psychology at Rockhurst University; Zach Pettet, UMKC ’15, co-founder of #OneDayKC, and employee at blooom; Landon Young; Ben Williams, Assistant Director of the Regnier Institute at UMKC; Andrea Essner of the Center of Entrepreneurial Ecosystem Development (C.E.E.D. ); and Conner Hazelrigg, William Jewell College ’15, University Innovation Fellow, and founder of 17°73°. Panel moderator Trevor Nicks asked the group how we can better prepare students in Kansas City, and around the country, to enter the entrepreneurial economy and compete at a global level. They discussed the importance of building community, promoting your achievements (even though it’s hard), asking for help (which is harder), making in-person rather than digital connections, helping others look good, using data to back up your activities, and forging alliances with faculty, administrators and community members that benefit both you and them. The day after #OneDayKC, Fellows heard from a panel of local entrepreneurs and educators. Photo by Laurie Moore. After the panel, the group of Fellows toured the Sprint Accelerator with John Fein, Managing Director of the Sprint Accelerator. In this co-working space, Fellows learned about the dedication of a large global company to the innovation of a city. Sprint Accelerator is also the home of TechStars, a three-month, mentorship-driven startup accelerator that helps startups build the future of mobile technology. Later that same day, Trevor Nicks and Macy Tush hosted a series of activities with prospective first-year William Jewell students, their parents, and Fellows. Nicks and Tush challenged the participants to create a business idea from combining a noun and an adjective supplied by the participants. For two of the three groups, the word “velociraptors” was chosen, which resulted in some animated pitches after the brainstorming finished. This activity gave the prospective students an opportunity to flex their brainstorming muscles, and gave visiting Fellows a look into how William Jewell Fellows are applying their design thinking and creativity skills. Fellows helped run a workshop with prospective first-year William Jewell students and their parents. Photo by Laurie Moore. The meetup concluded with a debrief of the day, a discussion of William Jewell’s #uifresh activities, and a group photo at the college’s iconic sign. More than 300 University Innovation Fellows and their faculty sponsors spent four days in Silicon Valley learning how to make lasting change in higher education. In the third week of March, hundreds of students traveled to Silicon Valley. For many of them, it was spring break. They could have been relaxing on a beach or making up for lost sleep. Instead, they were learning how to create solutions for challenges at their schools and out in the world. At the University Innovation Fellows Silicon Valley Meetup, more than 300 Fellows and Fellows’ faculty sponsors from 83 universities took part in four packed days of activities (view agenda). They spent their time learning at Google, Stanford University’s Hasso Plattner Institute of Design (d.school), and Microsoft, and toured several Bay Area companies and organizations. They learned everything from how to create spaces for innovation to how to be effective leaders and supportive followers. All of the activities were focused on giving participants tools, connections and inspiration to make lasting changes back at their home institutions. After a Thursday night registration, attendees woke up early Friday morning and boarded buses to Google for a full day co-hosted by Frederik Pferdt — head of Innovation and Creativity Programs at Google and co-founder of The Garage — and Fellows program co-leader Leticia Britos Cavagnaro. Pferdt shared his thoughts on the innovation culture at Google and the importance of using a “yes, and” mindset rather than “yes, but.” The “yes, and” mindset allows team members to build on one another’s ideas, while the only opportunity a “yes, but” mindset provides is to add an objection. The first mindset facilitates conversation and creates new ideas while the second shuts them down. From left, program co-leaders Humera Fasihuddin and Leticia Britos Cavagnaro and Frederik Pferdt. Photos by Ryan Phillips. The Fellows heard from Tilek Mamutov, project manager of special projects at X (formerly Google X), about “10x” or moonshot thinking. He encouraged them to think big and create a solution 10 times better than what already exists. Later in the day, attendees took part in a mindfulness exercise directed by Google’s Ruchika Sikri and discussed people development at Google with panelists Sikri, Adam Leonard, Emily Triantos, and Regina Getz-Kikuchi. The students and faculty teams also participated in a series of activities designed to promote moonshot thinking. They stepped through the design thinking methodology, learning how to brainstorm as many solutions as possible and how to prototype and test their ideas using inexpensive materials. 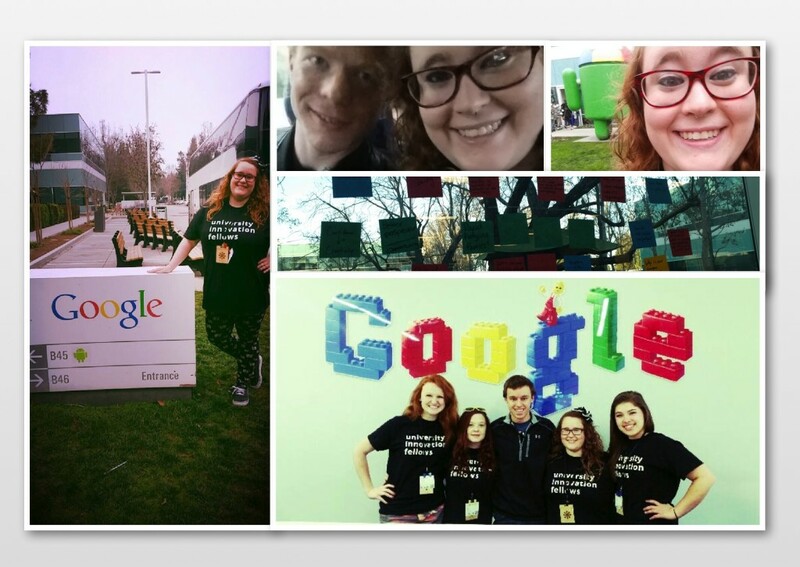 Top left: students in a design thinking challenge; top right: Molly Wasko wins the “Rock Paper Scissors” tournament; bottom left: a brainstorming prompt; bottom right: Fellow Bre Przestrzelski interviews panelists on people development at Google. During the day at Google, participants took part in several exercises to help them empathize with one another, let go of their assumptions, and create lasting bonds with teammates. In addition to preparing the students for the activities to come, these exercises are are also ones that the students can use back at their schools as warm-ups for events with their fellow students. In one exercise, they participated in a tournament-style “Rock Paper Scissors” competition with a twist: each loser became the winner’s biggest cheerleader. The end result was two competitors each backed by half of the entire room cheering their names, and the winner was Molly Wasko, a faculty sponsor from the University of Alabama. The Fellows and their faculty sponsors spent Saturday at Stanford’s d.school taking part in a circuit of activities that allowed them to explore different ways of learning. They discovered the connections between leadership and movement with Stanford contemporary dance instructor Aleta Hayes, explored how the d.school uses physical space to promote specific learning outcomes and explored how learning can happen everywhere, beyond the walls of the classroom. Later in the day, the participants heard from entrepreneur and educator Steve Blank, who was interviewed by Epicenter director and Stanford Engineering professor Tom Byers. Blank, “the Obi Wan Kenobi of Innovation” as one Fellow referred to him on Twitter, spoke about the need for students to learn an entrepreneurial mindset and shared details about the new “Hacking for Defense” class he started teaching this quarter at Stanford. Participants also took part in a workshop on Edward de Bono’s six thinking hats system for group discussion, a session on visual thinking taught by high school students from the Nueva School, a workshop on how to design their own pop-up classes, and an improvisation class with d.school lecturer Dan Klein. Top left: Steve Blank chats with Tom Byers; top right: Fellows show off their leadership moves; bottom left: Dan Klein leads an improv workshop; bottom right: Fellows try on different different thinking hats. In the evening, keynote speaker Peter Sims — an entrepreneur, author and social innovator — spoke to the Fellows about social change in the world today. During his talk, he mentioned GoldieBlox, a company that creates toys and games to help girls develop early interest in engineering and problem-solving confidence. This mention triggered an enthusiastic response from Nada Saghir, a Fellow from Lawrence Technological University, who was sitting in the front row. Nada was invited on stage to share details about the company with the audience. Sims was so taken by her enthusiasm that he offered to connect her with company founder Debbie Sterling for a potential internship. On Sunday morning, the last full day of the meetup, the group headed to Microsoft, a visit that had been left a surprise until the buses pulled up at Microsoft Silicon Valley headquarters in Mountain View. Attendees heard about the connections between culture, innovation and leadership from Jeff Ramos, Senior Director of The Microsoft Garage, and about early-career leadership perspectives from Rolly Seth of Microsoft and the World Economic Forum. Christine Matheney, Technical Evangelist at Microsoft, encouraged Fellows to constantly ask themselves “why do we do it that way?” and T. K. Rengarajan, Corporate Vice President of Microsoft Technology and Research Global, shared a big vision for changing the world. Top left: Jeff Ramos speaks to the Fellows; top right: selfies at Microsoft; bottom left: Fellows present ideas at the unconference; bottom right: brainstorming new ideas to impact education. After hearing from Microsoft leaders, Leticia Britos Cavagnaro kicked off an unconference, which encourages a casual idea exchange around participant prompts and questions. Questions that Fellows and their faculty posed included “how might we bring innovation and design thinking to the research setting?” and “how can we integrate tools for discovering your passion into all levels of education?” At the end of the unconference, groups that had formed around the questions pitched their ideas to the whole group. The group traveled to the d.school for the rest of the afternoon, where they took part in a negotiation workshop with David Johnson of the Stanford Law School. Fellows learned how to have better conversations with stakeholders at their schools by taking part in a role-playing experience to understand the perspectives of others. Afterwards, the entire group of Fellows and faculty gathered in the d.school atrium for a fireside chat with Sebastian Thrun, founder of Google X, and CEO and co-founder of Udacity. Interviewed by Fellow Ryan Phillips, Thrun advised the group to make learning a part of their daily lives. He told the Fellows that fear is the culprit of lack of innovation, and that true leaders have the guts to do the right thing. Sebastian Thrun, interviewed by Ryan Phillips, shares his advice with the attendees. On Monday, many of the students took part in learning journeys to innovative Bay Area companies and organizations before traveling back to their schools. Groups spent the morning visiting Microsoft, Autodesk, co.lab, Nearpod, Stanford Technology Ventures Program, Stanford’s Center for Design Research, Stanford’s Center for Entrepreneurial Studies, SAP, LucasFilm, Draper University and StartX. Just as the Fellows community believes that students should be co-designers of their education, students were also co-designers of the entire Silicon Valley Meetup. Along with program staff, 18 Fellows facilitated sessions, assisted with event logistics, and presented their stories to the attendees throughout the event. The Fellows who co-led this event were Chris Ashley, Timothy Moore and Jack O’Neill of James Madison University; Francis Atore of NXP Semiconductors and Texas Tech University ’14; Robin Bonatesta of Kent State University; Corey Brugh of the Colorado School of Mines; Bradley Dice of William Jewell College; Magann Dykema and Bradley Turner of Michigan Technological University; Adrien Feudjio of Morgan State University; Nadia Gathers of CODE2040 and Converse College ’15; Benjamin Matthews of the University of Virginia; Ryan Phillips of Microsoft and the University of Oklahoma ’15; Bre Przestrzelski of Clemson University; Valerie Sherry of the University of Maryland; Tanner Wheadon of Utah Valley University; Daricia Wilkinson of the University of the Virgin Islands; and Alan Xia of Kettering University. Photos by Laurie Moore, Ryan Phillips and Alan Xia. 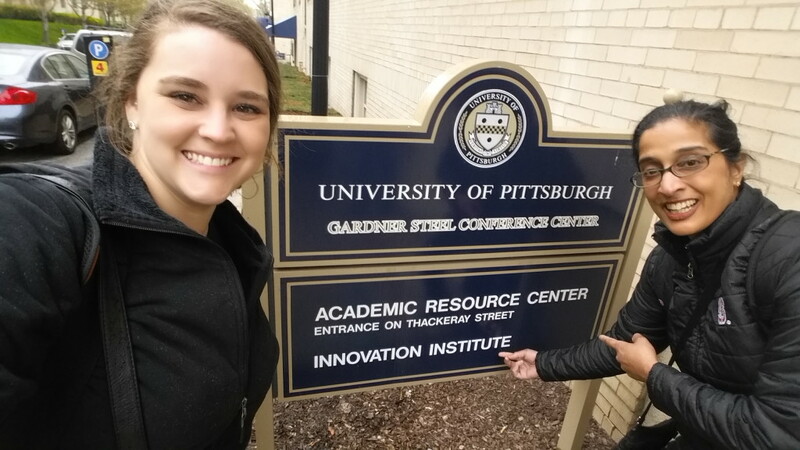 It was a cloudy, rainy day during finals week in April 2015 when we arrived in Pittsburgh, Pennsylvania, to visit 6 Fellows at the University of Pittsburgh (UPitt). UPitt is a sprawling, urban campus with beautiful stone buildings that spans 132 acres of city blocks. Campus was abuzz with students walking from building to building and occupying all the study spaces. We met Fellows Nate Smialek, Brian Rhindress, Ian McIntyre, Madhur Malhotra, Jenny Sommer and David Jacob at the Innovation Institute, along with supporter Babs Carryer, Director of Education and Outreach. The Innovation Institute was recently launched through the Office of the Provost in 2013 to bring together major areas of innovation on campus: the Office of Technology Management, Office of Enterprise Development and the Institute for Entrepreneurial Excellence. This recent structure was put in place to build a culture of innovation and entrepreneurship at UPitt, which fits with the mission of the Fellows and their faculty sponsor, Mary Besterfield-Sacre, and provides a neutral zone across campus to foster a hotbed of activity in regards to innovation and entrepreneurship (I&E). In the main conference room, outfitted with whiteboards and smart TVs, we were able to learn about the recent projects the Fellows had undertaken. The first project was the Pitt Design Hub. The Design Hub is a student organization originally named Engineers for Sustainable Medical Devices (ESMD) that was created by Fellow (now UPitt alumna) Karuna Relwani. ESMD’s mission was to provide biomedical engineering students with hands-on experience working with physicians to design medical devices that physicians would actually use, from surgical mounts to brain stimulation. As the student organization grew, and more Fellows joined the crew at UPitt during the last year, ESMD has rebranded and grown into the Design Hub. The Design Hub has the same mission to still connect students to real-world projects and local physicians, but the student organization wanted to be more inclusive of other majors outside of biomedical engineering to reach all engineers and other majors, such as business. 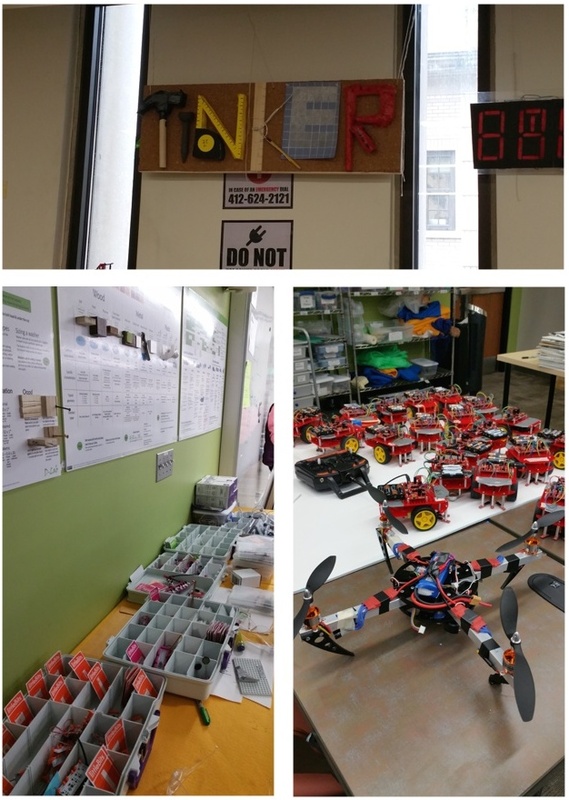 During the semester, the students participating in the class turned the classroom into a mini makerspace with hardware, tool kits, low-resolution prototyping materials and more. Building this space and experiencing the class allowed the freshmen to be actively involved with learning the curriculum. In the final 3 weeks of the class, the students focused on a specific project of their choosing. These projects stemmed from interactive periodic tables to a pineapple that controlled the playing of a violin. The student projects were showcased on the outer wall of the classroom in the hallway by a projector displaying rotating images. After catching up, we were able to get a tour of the engineering building, which is where the freshman class “Art of Making” is held (see photos of the classroom above), and where meetings for the Design Hub occur. We saw everything the students did and didn’t have access too, ranging from study spaces to classrooms and hallways to music studios. Interestingly, the hallways were a massive space for students to sprawl out and collaborate on projects or just to work and study, being at least 15 feet wide with whiteboard walls. Our visit was jam-packed with information and tours of campus and we were extremely excited that the Fellows made time for us during the busiest time of the semester. Adding a unit to the “Art of Making” course focused on media and how to communicate a design/product effectively through visual media. The Fall 2015 course was developed for upperclassman to spread the maker culture across other classes within UPitt’s engineering department. 7 final projects from the “Art of Making” were presented at the bi-annual Design Expo. There’s a lot of action through the Fellows at the University of Pittsburgh and we’re excited to see what the new year will bring. Keep up the great work! P.S. This post was written during the UIF Roadtrip 2015. March 16, 2015 — The National Center for Engineering Pathways to Innovation (Epicenter) has opened the application process for its University Innovation Fellows program for U.S. college and university students. The application deadline is May 11, 2015. Learn more and apply at http://dreamdesigndeliver.org/apply. The program is run by Epicenter, which is funded by the National Science Foundation and directed by Stanford University and VentureWell (formerly NCIIA). The Fellows believe that all students need to leave school better prepared to tackle our world’s big problems and create new and fulfilling jobs for themselves and others. They help their peers learn an entrepreneurial mindset and creative confidence by creating student design and maker spaces, founding entrepreneurship clubs and organizations, working with faculty to design courses, and hosting events and workshops. At present, there are 291 active Fellows from 115 schools across the country. Fellows take part in online training and in-person regional and national gatherings to study their campus ecosystems. The program provides a platform for Fellows to learn to be strategic thinkers, develop a student community to share strategies about what’s working at their schools, examine the landscape of learning opportunities at their schools, and formulate action plans to implement their ideas. Throughout the year, they have opportunities to learn from their network of Fellows, Epicenter mentors, and leaders in academia and industry. Leah Bauer and Kathryn Christopher are University Innovation Fellows working together at Grand Valley State University. David Duncan, Director of the Center for Innovation & Entrepreneurial Development at Clark Atlanta University, works with a team of University Innovation Fellows. Students, faculty and university leaders are forging partnerships like this across the country as part of the University Innovation Fellows program. Join the movement! The application deadline for the University Innovation Fellows program is May 11, 2015. Students can request an application, and faculty can request an application to sponsor a student at http://dreamdesigndeliver.org/apply/. The application deadline is May 11, 2015. Ideally, applicants are undergraduate students in engineering or other related STEM fields. However, Epicenter is thrilled to consider undergraduate and graduate applicants from all disciplines who are interested in technology, innovation and entrepreneurship and who are passionate about making a lasting impact at their schools. Students can apply individually or in groups of up to five, called a Leadership Circle. Applicants are sponsored by a faculty or administrator who can provide a program fee, secure funding for travel and provide a letter of support. Following acceptance, students take part in a 6-week online training and in-person events. Upon successful completion, students participate in a three-day immersive experience in Silicon Valley. Learn more and apply at http://dreamdesigndeliver.org/apply. This post originally appeared on the Epicenter website on March 16, 2015: http://epicenter.stanford.edu/page/press-release-apply-by-may-11-university-innovation-fellows-program. Alexandra Hamon is a Computer Science major at the University of Oklahoma. 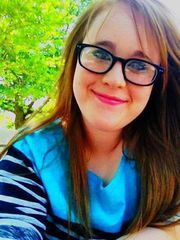 Alexandra is a passionate people person who is always excited to learn something new and inspire others to do the same. For her full bio, click here. I graduated from high school with a Senior class of 83 people. Needless to say, it was a very new experience for me to be in a room with 200 talented, driven people, each with a vision to leave the world better than they found it. The UIF Meetup was fun, engaging, and inspiring, but most importantly, it was an affirmation that there are students around the country who want more than to pass their classes and graduate. It was one thing to see everyone over webcam and comment on each other’s posts, but it was another to get to meet face-to-face, shake hands, and laugh together. It wasn’t about being at Google or Stanford, we could have been anywhere (though I am definitely glad we got to meet in such cool places). It was about just being together and becoming a team. At some point, I looked around and thought to myself, “We really are going to change the world“. Today is the VERY LAST DAY to submit an application to be considered for candidacy in our Spring 2014 cohort. We will not be accepting late applications. Visit our blog for testimonials from current and active UI Fellows. For more information, visit the student page or the faculty page. We look forward to seeing your application and are very excited about our plans for our new cohort! https://uifellows.wpengine.com/wp-content/uploads/2015/05/logo.png 0 0 Laurie Moore https://uifellows.wpengine.com/wp-content/uploads/2015/05/logo.png Laurie Moore2014-02-10 07:38:012014-02-10 07:38:01Last Day for Applications!! The six-week UIF Training Program was fundamental in transforming us, the UIFs, into advocates for our schools, our students, and our I&E movements. I enjoyed the opportunity to meet with countless other motivated students from across the country and have stayed in close contact with many of them- comparing our campus obstacles, our plans for our students, and bouncing ideas off of each other. The network we formed by way of the 6-week UIF training has been incomparable to any network of students I’ve had before. We are people who get the job done and have some fun while we’re at it. I am looking forward to continuing to interact with them and with NCIIA in the future. Breanne Przestrzelski is pursuing her Ph.D. at Clemson University. Her research focus is innovation and design in sports biomedical engineering. For more information, visit Bre’s Student Profile page. The unfortunate truth in this statement is that universities are laggards (i.e. extremely slow adopters). The ironic part is universities shouldn’t be, and we as UIFs, understand this. Universities are the training facilities of future intelligent generations and need to keep up with what we demand to learn through higher education. Knowing this, you need to be prepared to appeal to the senses of your university, and every university wants reassurance that your idea is going to work and eliminate any and all risk involved. The best way to create reassurance is to build case studies based on your UIF peer successes or otherwise. These ideas don’t need to necessarily be university-related examples. Ideas can stem from the corporate world and be adapted to your campus ecosystem. I digress to our days of learning from the sing-a-longs of School House Rock, but they got it right when they said, “Knowledge is Power.” The more knowledge you acquire about how these ideas were actually successful, the more faculty and staff will be willing to listen and help you execute your plans. After you have done your research and built a stash of great examples, solidify a meeting time and create a plan of approach. Know what you want to say; identify the goals you want to achieve out of this meeting; and practice your spiel. The person(s) you are going to meet with has a time-sensitive schedule and you will typically engage or lose their attention within the first three minutes, so hook them.Speak passionately and confidently about everything you prepared for and what you want to take action on at your campus. In your plan of approach, anticipate for questions and don’t falter when they ask. By asking you questions, they are making sure that you have done your research and actually know what you are talking about. Don’t be afraid to say, “I don’t know.” If you need to say “IDK,” follow it with something you do know that directly relates to the question they are asking. Or follow an “IDK” with asking for their advice on how to answer the question they posed. You want them to be so engaged that they are inadvertently dumping information on you that you weren’t aware of and will help you execute your plan (may be helpful to take notes or bring a second person dedicated to taking notes). Faculty and staff will wear the black hat. To prepare for this, talk about your idea with as many students, friends, classmates, or other mentors beforehand. Keep record of the questions they ask you so you can find answers and be more prepared for your meeting. During your meeting, be aware of with whom you are speaking. Watch their body language and yours. Their tone of voice will also hint at their interest. Make sure they are speaking to you as an equal and not down at you. If they appear to be speaking down at you, your message is being lost on deaf ears. If this is the case, don’t begin pleading and make sure you don’t react to their actions toward you out of haste. Take a deep breath and remember to respond respectfully. Cut the meeting politely and move on. This is a sign that you will need to continue your search in finding a faculty mentor that will listen, encourage and support your efforts. Elliot Roth is studying at Virginia Commonwealth University. He is currently the president of SEED at VCU. Big Beacon has invited Epicenter back for a Twitter Chat! The topic will be design thinking in engineering. If you would like to join in, use #BigBeacon during the designated time and you will be able to follow the live conversation. Join the conversation by answering questions and chatting with other participants. Here is a link to Epicenter’s previous Twitter chat with Big Beacon. I am ruthless! Thank you, @BenEinstein of Bolt, for articulating the INSTINCTS and RUTHLESSNESS required to bring a great product into the world. Trish Compas-Markman, Engineering Innovator and Founder of DayOne Response highlighted in Clinton’s Huffington Post article. In an excellent piece released today on Huffington Post, Chelsea Clinton articulates the reasons why the time is now for gender equality in STEM. We need to better harness the curiosity, imagination and inventive spirit of the other half of the globe’s population. Until we do, we are sub-optimum at a time when the world’s problems beg for creative solutions. I urge Student Ambassadors, in specific, and University leaders in general to read the article on the Huffington Post site and think of ways to attract more women to their STEM programs as they cultivate the next generation of innovators. 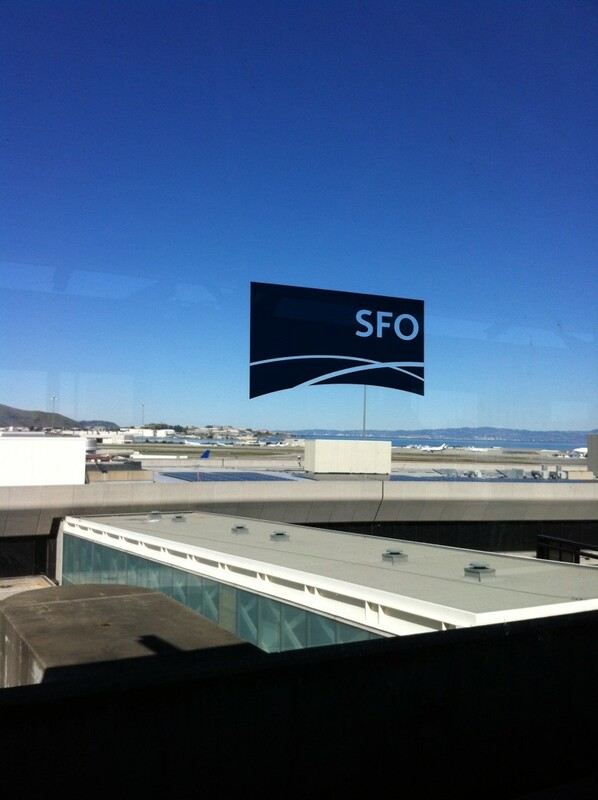 Student Ambassadors arrive to SFO today, hitting Stanford’s signature Entrepreneurial Thought Leaders lecture series first, followed by the popular Spirit of Entrepreneurship course. These two offerings represent ingredients in ‘secret sauce’ at Stanford and Student Ambassadors will be attending both. Among the other amazing things planned is a tour of Google and PayPal… and the meeting of 20 Google Venture-backed companies. Stay tuned here for pictures, comments and ideas for student leaders all over the nation. Student Ambassadors who are not here with us in the Valley this week will enjoy an extensive report and briefing of the opportunities uncovered that they can take advantage of for their own campuses. By the way, the Spring Training session has been pushed forward to March, closer to the OPEN conference. There’s still time to register for training. Visit this link for details. Speaking of Cooper Union, Rachel Maddow Show! Genius! Pizza Pulley for Engineering Protesters at Cooper Union covered on Rachel Maddow Show. Cooper Union history and sit-in, which started Monday, is highlighted during last night’s Rachel Maddow show. School administrators may begin charging tuition (presently a free education for every student) to make up for annual operating losses. Learn more by watching the Rachel Maddow show here. A group of Cooper Union alumns bought the students pizza and used engineering genius, and a combination of balloons, counterweights and a pulley, to deliver it to the 8th floor of the clocktower. https://uifellows.wpengine.com/wp-content/uploads/2015/05/logo.png 0 0 uifellows https://uifellows.wpengine.com/wp-content/uploads/2015/05/logo.png uifellows2012-12-06 15:14:022012-12-06 15:14:02Speaking of Cooper Union, Rachel Maddow Show! https://uifellows.wpengine.com/wp-content/uploads/2015/05/logo.png 0 0 uifellows https://uifellows.wpengine.com/wp-content/uploads/2015/05/logo.png uifellows2012-11-20 17:27:382012-11-20 17:27:38Exploding Pumpkins! NCIIA Staff are together with Stanford partners at the Epicenter Retreat where close to 75 Engineering Deans, Faculty and Administrators are engaging in an ‘Unconference’. Participant tweets reveal teams engaging in prototyping, discussion of online courses and more. Tune in to the hashtag #epiretreat for more.